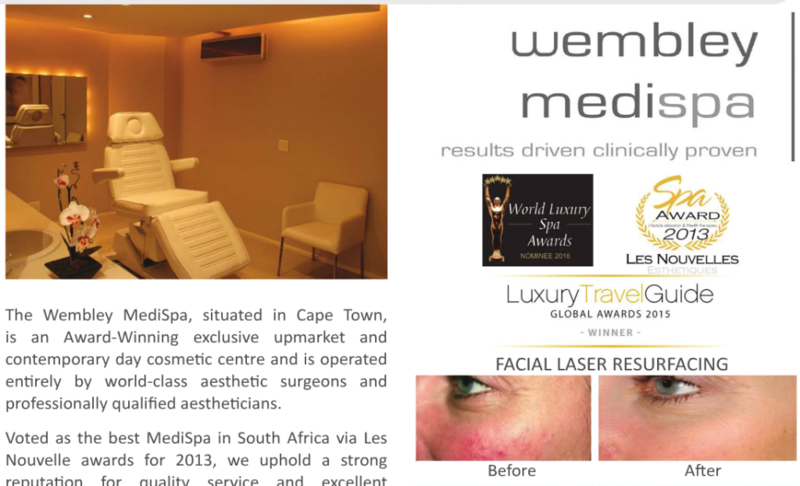 The Wembley MediSpa situated in the heart of Cape Town is an Award Winning contemporary day cosmetic institute, operated by professionally certified aesthetic specialists. The Wembley MediSpa also offers the latest most luxurious anti-ageing and every day spa therapies, including holistic grooming and beauty treatments‎ for facial and body concerns. Many of the results driven, award winning treatments have been developed exclusively by the clinic and are exclusive on offer at the The Wembley MediSpa and nowhere else in the world. The Wembley MediSpa is featuring in the Business Essentials Longevity E-magazine, click here to have a look. You’ll find us on Page 80.